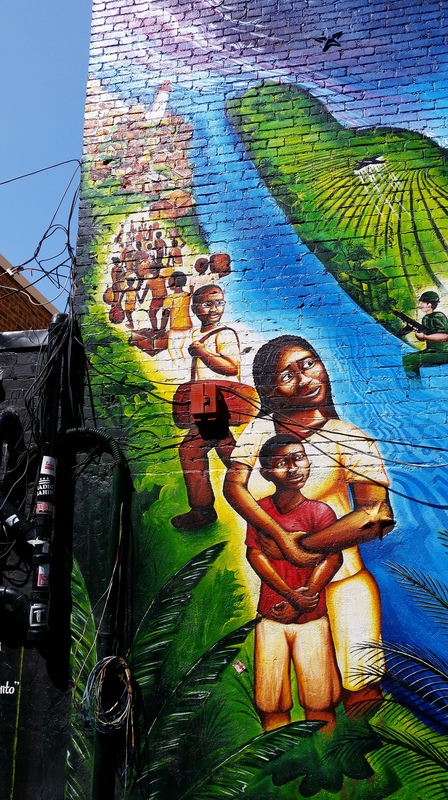 The Afro-Columbian Mural, also known as Currulao y Desplazamiento, is a public mural that celebrates the Afro-Colombian culture of D.C., while at the same time increasing public awareness about the widespread displacement and other human rights violations related to the ongoing armed conflict in the South American country of Colombia. 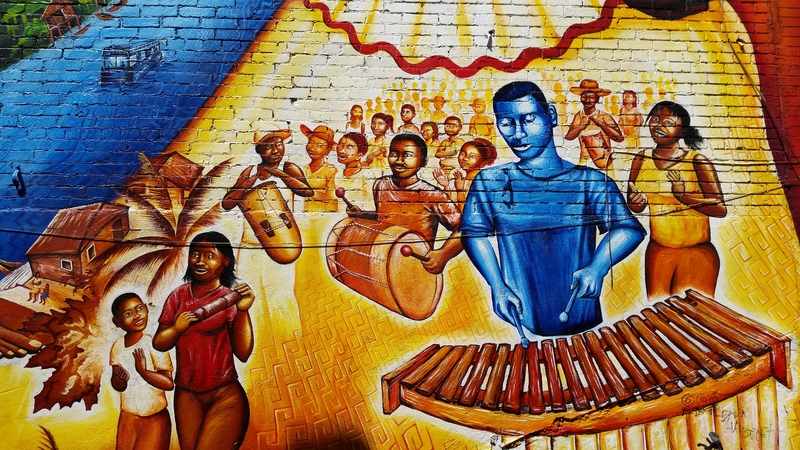 Located in an alley at 1344 U Street (MAP) in northwest D.C.’s U Street corridor, the mural was funded by the D.C. Commission on the Arts and Humanities, and created by internationally recognized muralist Joel Bergner and his organization, Action Ashé! 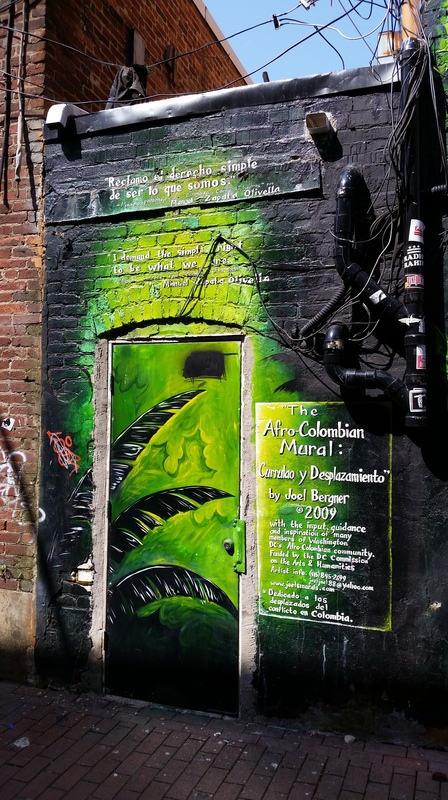 Global Art & Social Action Initiative, who also painted a number of other mural throughout the city, including Release Your Burdens and Be Free, Cultivating the Rebirth, “My Culture, Mi Gente” and A Survivor’s Journey. According to the artist, he designed this mural with guidance, input, and inspiration of many of my close friends in D.C.’s Afro-Colombian community, many of whom have been granted political asylum in this country due to the severe human rights violations. For additional inspiration, he also traveled to the Pacific Coast region of Colombia where the conflict is often most severe to visit his friends’ families, do research, and learn more about the political situation. The colors of the mural are vibrant, intriguing and welcoming, while the mural’s complex content is depicted by several different scenes. 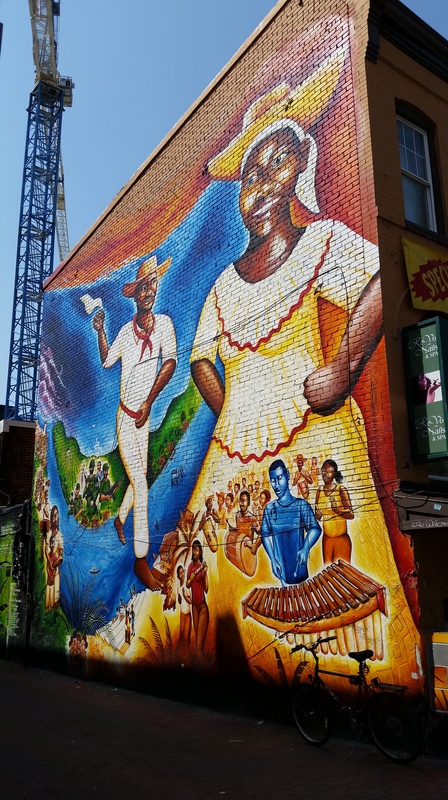 The size of the woman in the mural and the people underneath her portray the importance of Afro-Colombian traditions and culture. 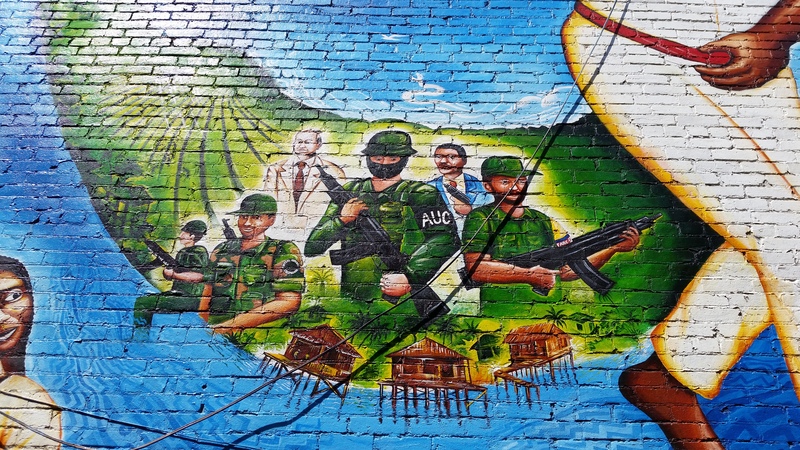 These encouraging images are in a paradox with the depiction of the Colombian paramilitary, with people running from the forces, while a group of Afro-Colombians being exiled to huts is in the foreground. And while working with a green field, Bergner also paints an airplane hovering above releasing ammo on the people below. 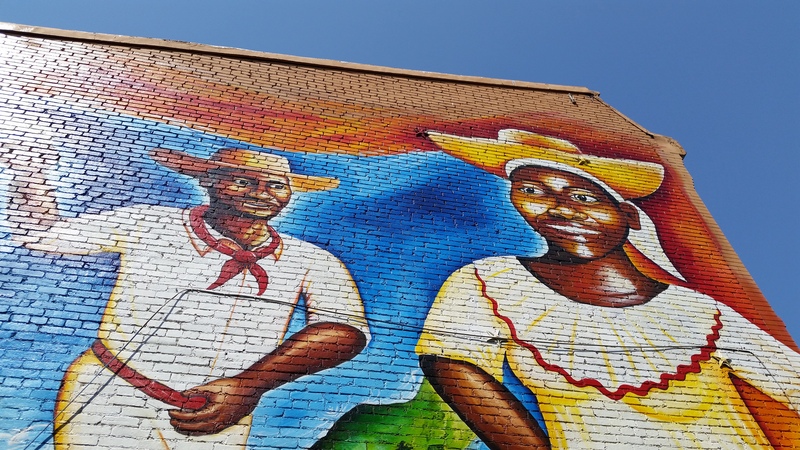 The mural was completed in 2009, and unveiled at a public event featuring speeches from the Afro-Colombian activist Marino Córdoba, as well as live music, traditional Afro-Colombian food, and a traditional dance presentation by the local Afro-Colombian dance group Tangaré. The event was co-sponsored by TransAfrica Forum and the U.S. Network in Solidarity for Afro-Colombian Grassroots Communities. On days when I want to go on a longer than usual lunchtime bike ride, one of my favorite destinations is Old Town Alexandria. And that is where I rode to today. And it was during this ride I visited the Alexandria Market Square and City Hall, located at 301 King Street (MAP). 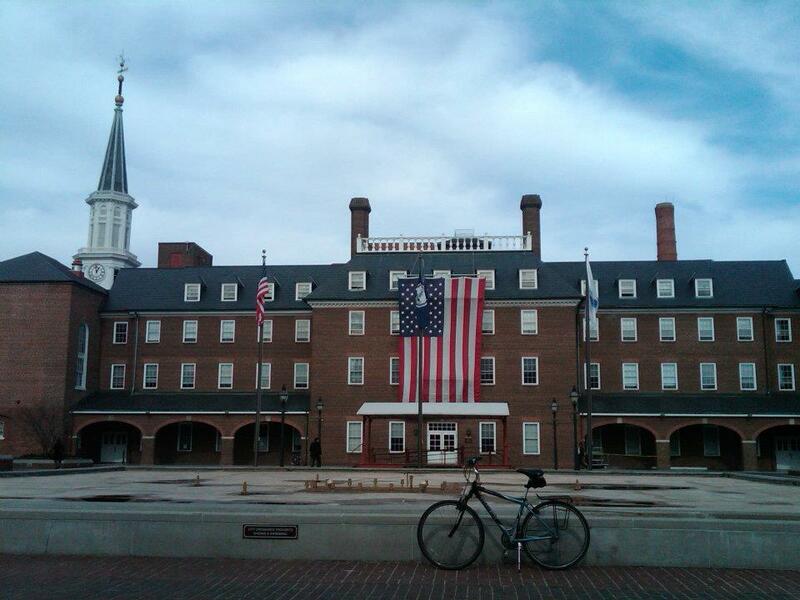 The site of the Alexandria Market Square and City Hall originally began as a market beginning in 1749. Then in 1752, lottery proceeds funded the building of a town hall and courthouse on the site. George Washington served as a justice in this court. Later, in 1817, a new three-story brick building was constructed, including a town clock tower designed by Benjamin Henry Latrobe. But an extensive fire in May of 1871 gutted the building. 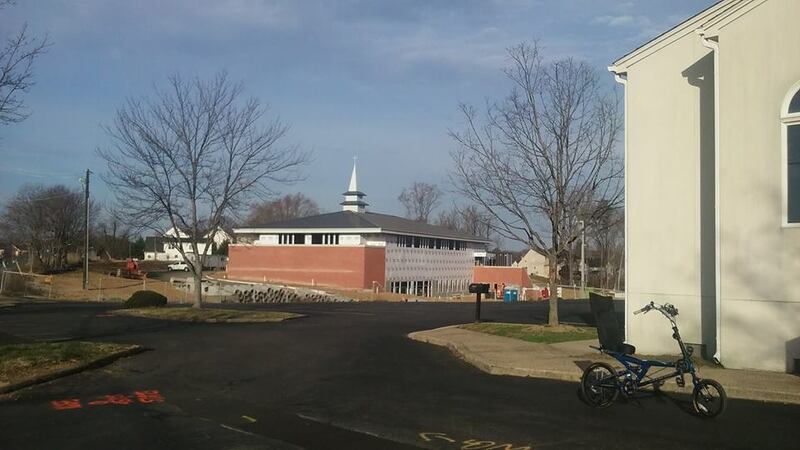 Given the importance of the building, the townspeople raised enough money to pay for an exact replica of the former building. 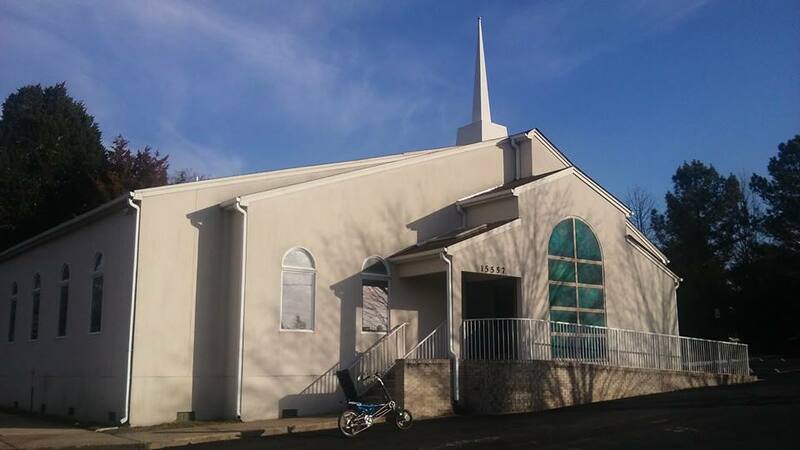 And that building, which was added to the National Register of Historic Places in March of 1984, is still standing today. The current Second Empire-style building was designed by Adolph Cluss, was a German-born American immigrant who became one of the most important architects in the D.C. area, in the late 19th century. 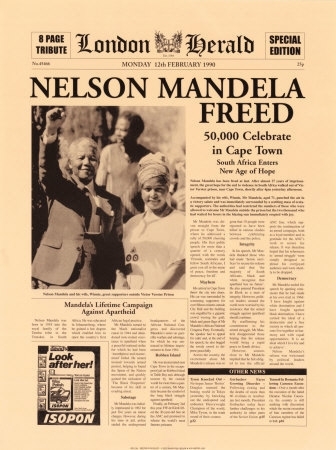 He was nicknamed the “Red Architect” based on red brick being his favorite building material, and his early communist sympathies, though later in life he became a confirmed Republican. Cluss is responsible for designing scores of major public buildings in the D.C. area, including at least eleven schools, as well as markets, government buildings, museums, residences and churches. His designs include the Franklin School and the Sumner School, as well as other notable public buildings in the capital, including the Smithsonian Arts and Industries Building, the U.S. Department of Agriculture Building, Calvary Baptist Church, and two of the city’s major food markets, Center Market and Eastern Market. The original city hall was something of a complex, containing the court facility, both the principal police and fire stations of Alexandria. The Alexandria-Washington Masonic Lodge also had its headquarters located in the building until 1945, when it moved out of City Hall and into the new George Washington Masonic National Memorial on nearby King Street. Today the City Hall building houses many of the Alexandria government offices, including the City Council Chambers on the second floor. During this lunchtime bike ride I came across an unusual free-standing column in the plaza in front of the E. Barrett Prettyman United States Courthouse, located on Constitution Avenue east of John Marshall Park, between 3rd and 4th Streets (MAP), not far from the Sir William Blackstone Statue and directly across the street from The George Gordon Meade Memorial in Downtown D.C. 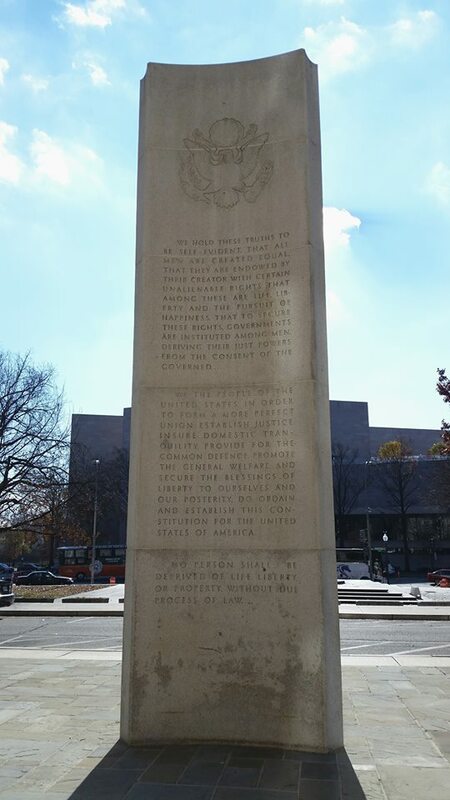 The 24-foot three-sided granite obelisk is entitled The Trylon of Freedom, and was dedicated along with the courthouse in 1954. The work was designed by Carl Paul Jennewein, a German-born American sculptor. Best known for sculpting architectural elements in buildings, his work appears throughout the United States. Locally, Jennewein’s works include two panels in The White House, sculptures in the Robert F. Kennedy Department of Justice building, monumental figures in the Rayburn House Office Building, The Darlington Memorial Fountain, and monumental eagles at the entrance to Arlington National Cemetery and on the Arlington Memorial Bridge. the division of power among the three branches of the Federal government: legislative, judicial and executive. 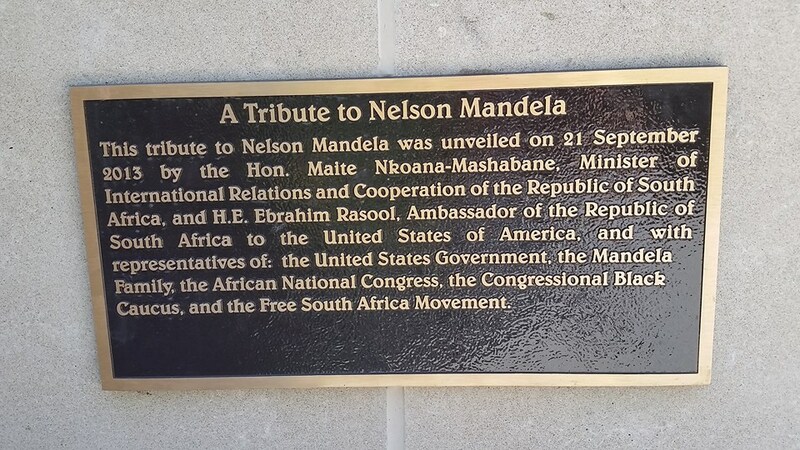 The southwest side represents the executive branch and depicts freedom of the press, speech and religion. 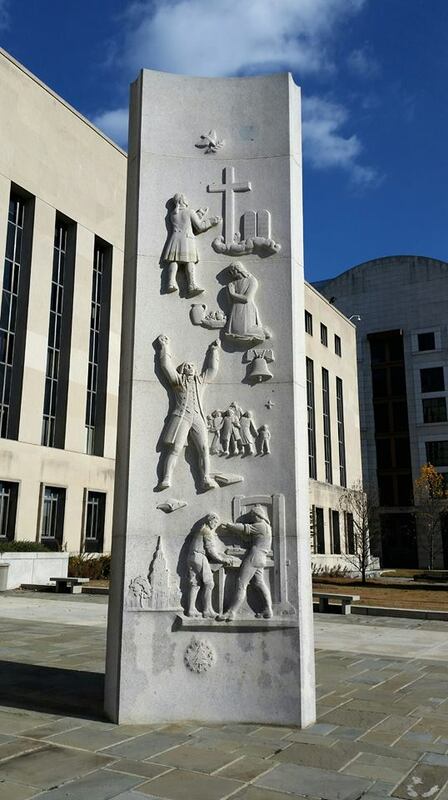 It is adorned with relief carvings of a men at work on a printing press to illustrate the right to freedom of press; a man giving a speech to illustrate the right to freedom of speech; and a woman kneeling in prayer and a man standing in front of a cross to illustrate freedom of religion. 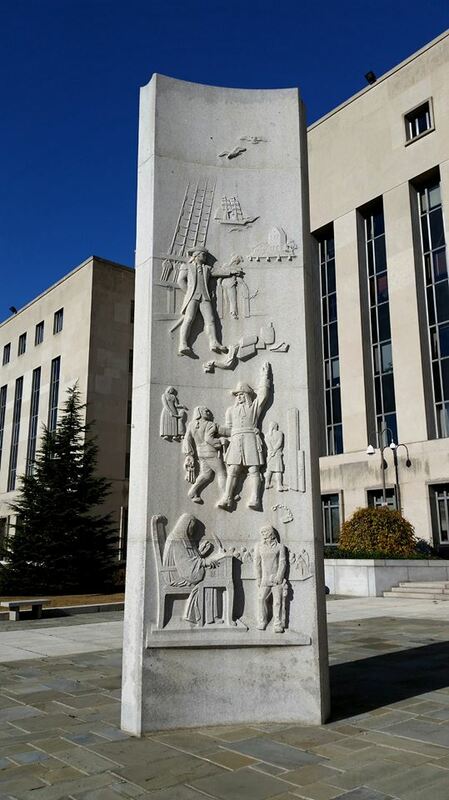 The southeast side, which represents the legislative branch, is adorned with relief carvings of a courtroom with a defendant standing before a judge and jury to illustrate the right to trial by jury; a man mediating between a prisoner and his executioner to illustrate protection against cruel and unusual punishment; and a wharf with confiscated goods to illustrate illegal search and seizure. 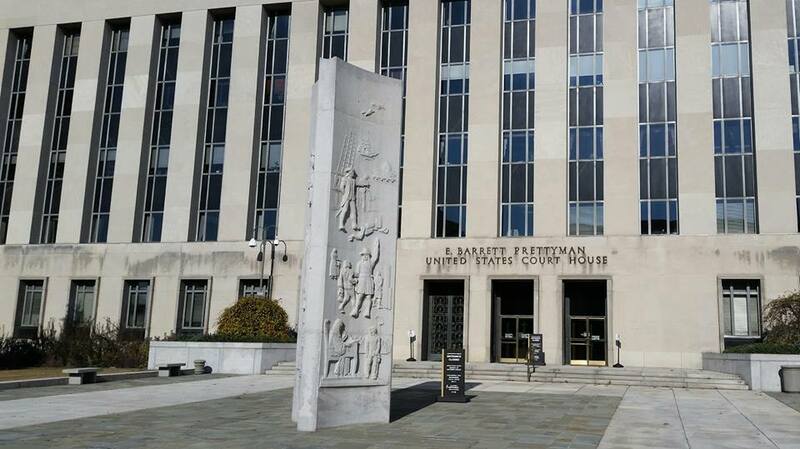 Interestingly, the Federal courthouse where the Trylon of Freedom is located was renamed in 1997 in honor of E. Barrett Prettyman, the former Chief Judge of the U.S. Court of Appeals for the District of Columbia Circuit. 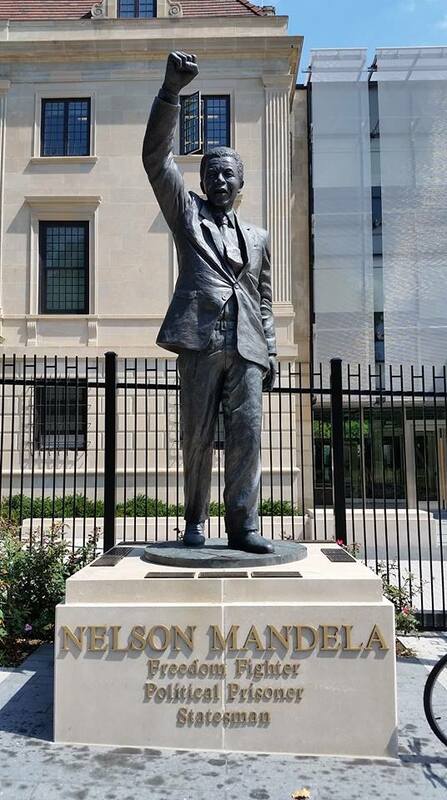 And it was Prettyman who 43 years earlier had advocated for the installation of the artwork in front of the new courthouse. Today this blog is three years old. And on this anniversary of when I began writing about the daily bike rides I take during my lunch breaks at work, I find myself still having as much fun as I did when I started. In fact, I’m having as much fun as when I was a kid riding my first bike, which was a bright green Schwinn Stingray coaster bike with a vinyl banana seat, U-shaped handle bars, a medium height sissy bar, chrome fenders and white-wall tires. The bikes I ride now are different than the one I rode then. And so am I. But the enjoyment is still the same. 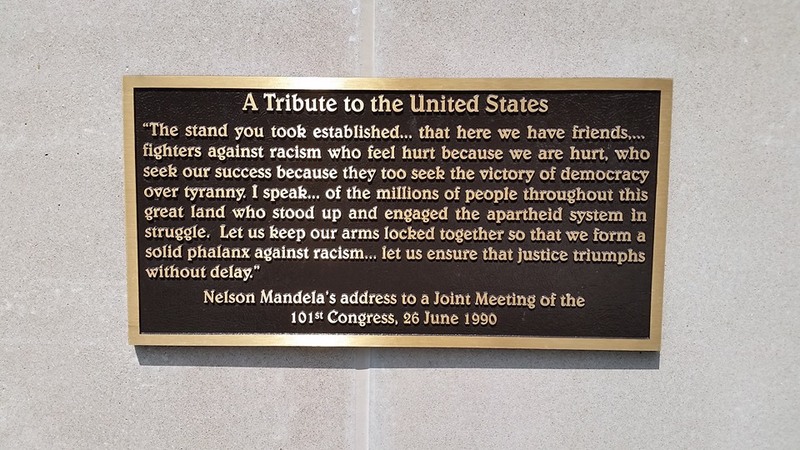 My original goal when I began this blog was to try to find and write about at least 365 different monuments, statues, memorials, and other places and events in D.C. that I think are interesting. I thought that number would make it a compilation of one year’s worth of daily attractions for people to visit in the D.C. area. 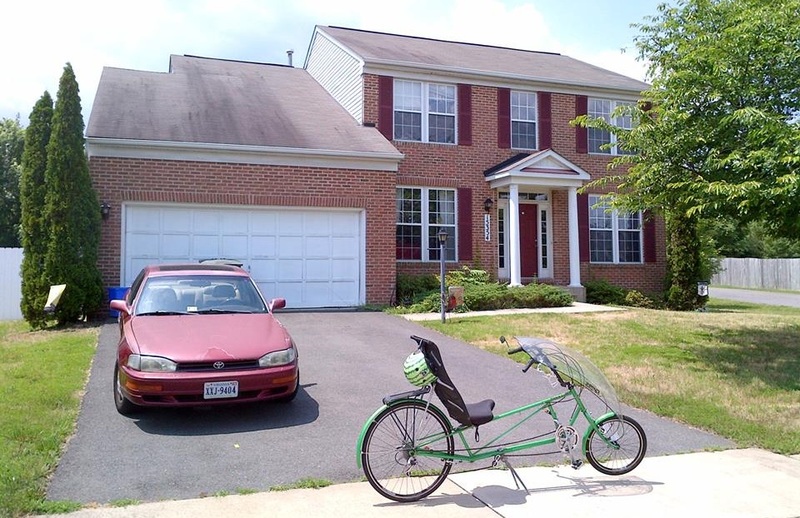 But the D.C. area has so much to offer that even after I reached my goal I continued riding and writing. 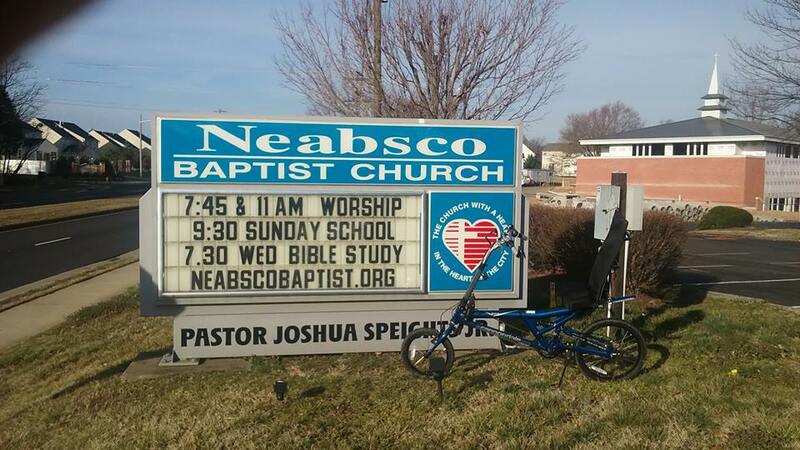 As of today there are blog posts about 441 bike rides to different places. And there is no end in sight. There are literally hundreds of more monuments, memorials, statues, places or events that I have either already visited and not yet written about, or have identified and am planning to visit in the future. In fact, I already know of more places I still want to ride to than the number I have already written about. So I should be able to keep writing for the foreseeable future. I just hope to be able to go to all of them before I retire, because I am eligible in only 571 days. 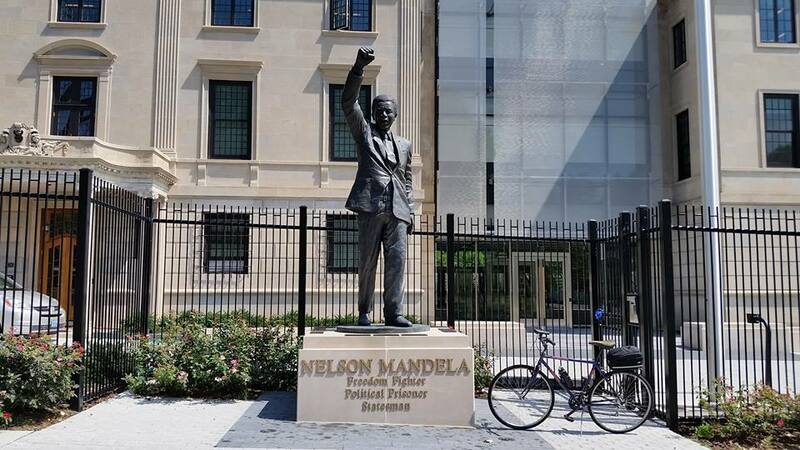 During all of my lunchtime bike rides over the past several years I have been able to enjoy hundreds of aspects of the city and surrounding area. From monuments and memorials to churches and cemeteries, there is always something interesting to discover and learn about. But on this ride I happened upon something that up until this point I had not seen before. 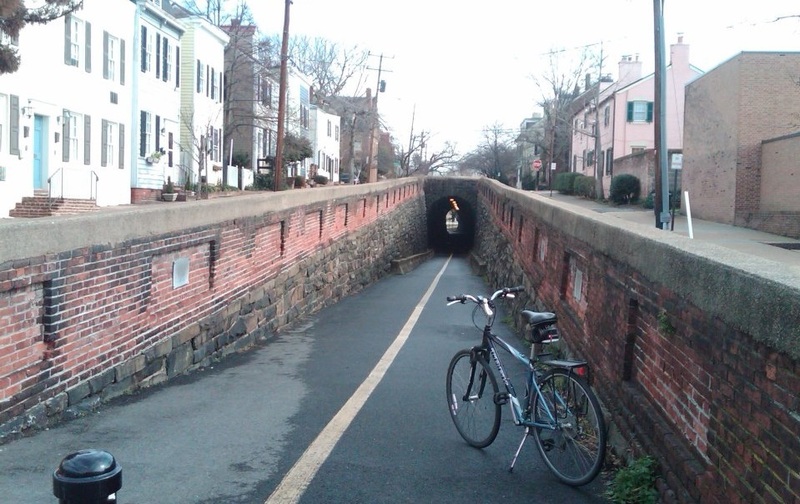 As I was riding in Old Town Alexandria I happened upon an old underground tunnel. Located near the eastern end of Wilkes Street (MAP), with an entrance to the west of Windmill Hill and Shipyard Parks, it turns out that it is the Wilkes Street Tunnel, which originally was a railroad tunnel used by Union troops during the Civil War to ship supplies from Alexandria to Richmond and points south. And I didn’t even have to wait until after my ride to learn about it because there is a plaque on the wall at the western end of the tunnel that provides its history. The plaque reads, ” The Wilkes Street Tunnel was part of the Orange & Alexandria Railroad, founded in 1848 to promote trade with western Virginia. The Orange and Alexandria inaugurated its track in Alexandria on May 7, 1851 with a run to the north end of Union Street to the Wilkes Street Tunnel. Thus, the tunnel linked the railroad to warehouses and wharves along the waterfront. Located nearby, the Smith and Perkins foundry manufactured locomotives for the Orange and Alexandria and other railroads. Wilkes Street Tunnel is typical of cut-and-cover tunnel construction. Presumably, the tunnel was cut through the bluff overlooking the Potomac River and covered to continue the streets above. After the sides were built up with stone, the arch probably was constructed over wood falsework from both sides using a centering technique to form the brick barrel vault. The tunnel was deepened after World War I to accommodate higher boxcars. The Orange and Alexandria line was one of the many Alexandria railroads taken over by Union forces at the onset of the Civil War. While this northerly section of the railroad was incorporated into the U.S. Military Railroads, the length of track south of the Rappahannock River remained in Confederate hands. Both sections played an major role in the strategies of North and South, as well as a decisive element in the Confederate victory at the Second Battle of Manassas or Bull Run. The Wilkes Street Tunnel gave Union Army access to the wharves for shipping military supplies on car ferries south of Aquia Creek, terminus of the Richmond, Fredericksburg & Potomac Railroad. Shortly after the Civil War, the old Orange & Alexandria line was incorporated into the Washington City, Virginia Midland & Great Southern Railway controlled by the Baltimore & Ohio Railroad. 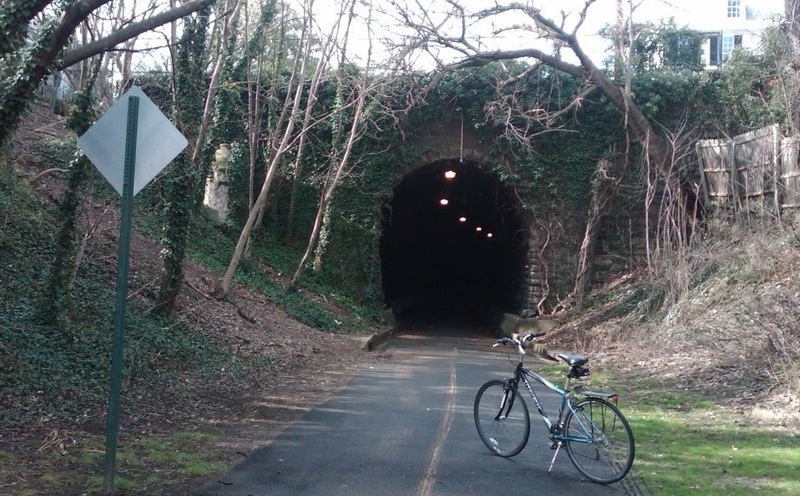 Wilkes Street Tunnel played a part in the rivalry between the Baltimore & Ohio and Pennsylvania Railroads for supremacy in the north-south trade across the Potomac River. The Pennsylvania Railroad acquired Congressional authorization for exclusive use of Long Bridge (14th Street). To maintain a competitive position, Baltimore & Ohio offered trans-Potomac service by way of carfloats linking Wilkes Street with Shepherd’s Ferry on the Maryland shore until about 1906. The interior of the tunnel consists of dry-laid grey sandstone vaulted walls. Its dimensions are approximately 170 feet long with exterior stone and brick surfaces, and an interior consisting of grey sandstone masonry, with a 15-foot deck and an arch with a vertical clearance of 17 feet. The city completed a structural refurbishment of the tunnel in March of 2008, and a ribbon-cutting ceremony was held on March 11th. Today the tunnel is open to pedestrians and bike riders like me.